« International Women’s Day 2015: That Old Chestnut Called Feminism! 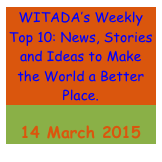 Welcome to our Weekly Top 10. This week we have a wide range of stories including the latest racism research, children in detention and in refugee camps around the world, as well as a look back on some great stories about International Women’s Day and the Sydney Mardi Gras celebrations. 1. An amazing piece of art work was revealed this week in Melbourne. The face of William Barak, an Indigenous elder of Melbourne’s Wurundjeri tribe, has been created on the side of the new Grocon apartment building. William Barak was an artist and a leader in social justice and he is credited with “building a bridge between black and white culture”. 2. Our Weekly Top 10 has often featured stories about the work of the UNDP (United Nations Development Project) because not only do they do great work but they also present the results of their work in such a beautiful and accessible form (and of course they are largely GOOD NEWS stories about the possibilities of change!). In this feature, UNDP presents the work they have been doing in Miraflores, Lima with farmers in their attempts to deal with climate change. 3. The UN has condemned recent attacks in Mali where five civilians were killed and seven injured. Some of those injured were UN workers. Mali has been in crisis since 2012 but recently progress has been made towards a peace agreement. 4. UNICEF has published a very helpful guide on how to present the argument against children in detention. They have provided four talking points to assist us in being clear and strong in our argument against children in detention. 5. Adam Rutherford writes in The Guardian about new insights into genetics and race and concludes that the more we research human genomes, the more one fact is undeniable – there is no such thing as race, only racism. And in this article, the research on the existence of racism is summarised with some disturbing studies. 6. The issue of children living in refugee camps is being explored in a new film, Kids in Camp. The film explores the stories of a number of children in refugee camps, including Grace who walks from her refugee camp to a nearby village to attend school. The majority of children in refugee camps receive no education at all. 7. In a strong display of solidarity, Muslims in Norway have come together with Jewish people to stand against extremism. Local Muslim people gathered to form The Ring of Peace around Oslo’s main synagogue as a show of support local Jewish minorities. The following week people again gathered but this time in protest of Islamophobia. 8. These are some more amazing stories about amazing women that were shared on the internet to celebrate IWD last week. We thought we would pass them on to you, even though the day has passed! National Geographic has posted some beautiful photos called Portraits of Strength: Seven Extraordinary Women. In this series of photos, published in the Huffington Post, the many different facets of women’s work are captured. 9. This is the story of Suzan who is a volunteer for the UNHCR program in South Sudan called, Safe From the Start. The program works with South Sudanese refugees in Uganda and focuses on preventing and responding to gender and sexual violence. 10. Sydney has hosted the 37th Mardi Gras Parade with 150 floats over 5 kilometres and more than 10,000 people in attendance. Here are some wonderfully vibrant pictures of the celebrations courtesy of ABC news that should put a smile on your face for the end of the week! Look forward to catching up again next week. In the meantime, keep an eye out for our blog coming tomorrow morning on Inspirational Leadership – something the world really needs right now!